At the meeting, Adityanath promised strict action against the guilty and a special probe while agreeing to increase compensation for the family after Kalpana told him that Tiwari also took care of his 80-year-old mother. Uttar Pradesh Chief Minister Yogi Adityanath meets Vivek Tiwari’s wife at his residence on Monday. Two days after Apple area sales manager, Vivek Tiwari was shot dead by an Uttar Pradesh police constable in Lucknow for allegedly trying to evade a check, his wife, Kalpana and two daughters met Chief Minister Yogi Adityanath Monday. “The Chief Minister has promised strict action against guilty of this heinous incident, while a Special Investigation Team has begun its probe. Moreover, instructions have been given to provide Rs 25 lakh assistance to his wife, Rs 5 lakh fixed deposits for his daughters and a job in the municipal corporation for his wife,” said a government spokesperson. 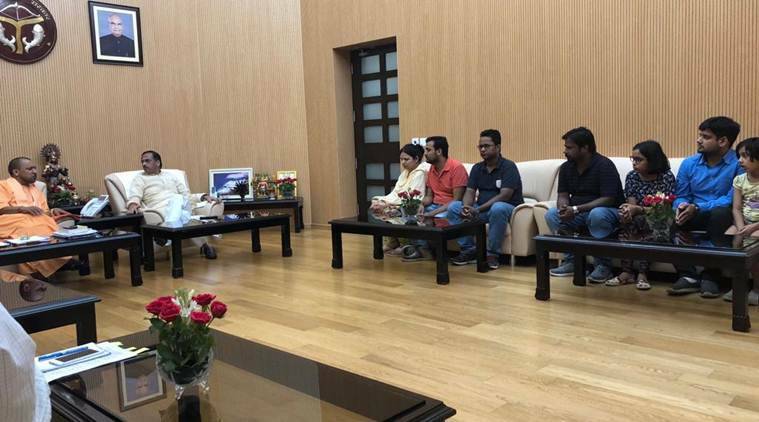 Deputy Chief Minister Dinesh Sharma accompanied Tiwari’s family to Adityanath’s official residence in Lucknow. Calling the incident “excessive use of force”, the Uttar Pradesh Police Saturday arrested two constables — Prashant Chaudhary and Sandeep Kumar — based on a complaint by Tiwari’s colleague, Sana Khan who was with Tiwari in the car when the constable opened fire. “Maine job ki paksha rakha, nishpaksh janch, mere awas ki samasya ka, mere bachon ki shiksha. Unhone har cheej mein samjha (I put before him the issue of a job, fair investigation, the problem of my house, education for my children. He understood everything)” said Kalpana. Kalpana has demanded a meeting with Adityanath since her husband was killed early Saturday morning. Hours after the incident, Kalpana and Tiwari’s family had even protested, refusing to cremate his body, until the state government promised action. After the meeting Monday, she said: “I trust my state government and this trust has increased even more today. Something that was not supposed to happen took place. The circumstances in which I have been caught today, I have lost the capability to take a stand,” she said. According to the government spokesperson, Adityanath has also given instructions to “solve” the problem of her house. Later in the day, Om Prakash Rajbhar, a BJP ally in UP who is also a minister and former chief ministers Akhilesh Yadav and Mayawati criticised the state government. Akhilesh said that this was not the first such incident. “It is the police’s duty to provide security and if the police start shooting bullets, you can imagine the law and order situation,” he said. According to BJP ally and Suheldev Bharatiya Samaj Party (SBSP) MLA Rajbhar, the police were trying to “cover up” the matter. On Twitter, Rajbhar said that law and order in UP had become a joke.